A 14 suspect mystery mystery set in a disco club in the late 1970s. Will accommodate an unlimited number of guests participating as sleuths. You will need a minimum of 14 suspects for this version of the mystery. Suggested investigation time is 2-3 hours. As with all of our mysteries, it is an INSTANT DOWNLOAD mystery package. The year is 1979 and the disco has ruled for almost a decade. Each evening, celebrities, politicians and other social royalty attend Studio Paradise, while every-day people line up outside the doors, hoping for the chance to get into the exclusive club or, failing that, spot a celebrity. At first it seems like any other evening at Studio Paradise, but when the owner, Louis Savage, is found shot outside his office, the patrons become suspects as his killer is sought. 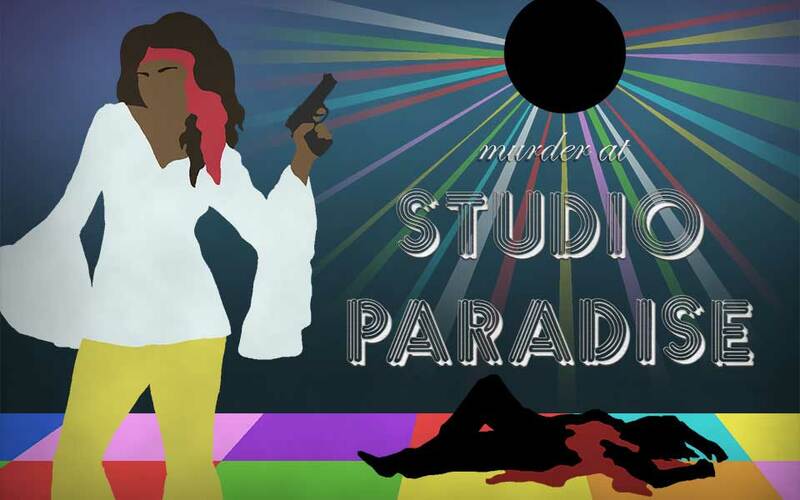 It’s up to the patrons of Studio Paradise to determine who had the motive, means and opportunity to kill the owner of Studio Paradise! This mystery is not suitable for kids, church groups or any other conservative audiences. THERE IS OFFENSIVE CONTENT, and while it is presented with the usual Shot In The Dark Mysteries style and class, you can expect drinking, drugs, violence and sexual references.